We are a Leading Manufacturer, Exporter and Supplier of Three phase motor, single phase motor, Torque motor, Vibrating motor, Crane and hoist duty motor, lift duty motor, Cooling tower motor, Two speed Motor, Single phase brake motor, Brake motor, Worm gear motor, helical gear motor, planetary gear motor, Fail safe brake, Bench Grinder machine, Bench polisher Machine, Flexible shaft Grinder machine, variable frequency derive, Ip 68 motor, Cycloidal Lantern Reducers, Dual voltage, Cut section ac motor, Gear Shaft, H class motor, Extend Shaft, Hollow Shaft Motor, Encoder Mounted Motor, Hollow shaft Brake motor, Center flange Vibrating motor, Geared Brake motor, Dabble flange motor, Two speed Gear Motor, Two speed Geared Brake motor, Two speed Vibrating motor, force cooling motor coolant pumps Ect. 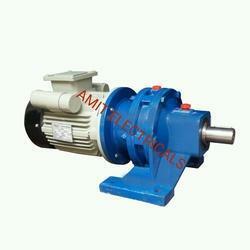 Amit Electricals manufacture, exporter and supplier of cycloidal speed reducers. industry experience in this field enabled us to provide a wide range of Cycloidal Speed Reducers to our reputed clients. The offered Cyclo Gear motors are widely applicable and demanded. Cycloidal speed reducer is Combination of Cyclo Gear and Motor. Amit electrical has excellent technological strengths and production facilities. Cycloidal reducers working principal is simple. The input shaft is mounted eccentrically to bearing causing the cycloidal disc to move in a circle. Cycloidal reducers disc will independently rotate around the bearing as it is pushed against the ring gear. The number of pins on the ring gear is larger than the number of pins on the cycloidal disc. It need to accurate machining. This causes the cycloidal disc to rotate around the bearing faster than the input shaft is moving it around, giving an overall rotation in the direction opposing the rotation of the input shaft. The cycloidal disc has holes that are slightly larger than the output roller pins that go inside them. The output pins will move around in the holes to achieve steady rotation of the output shaft from the wobbling movement of the cycloidal disc. Cyclodical Gear box body is Made by a robust, rugged cast iron frame with integral feet. It provid long life. Shaft id of single piece accurately made out of case carburized alloy steel. Solid with shaft made of high grade alloy steel so as to give hardware resisting surface duly case hardened & super finished. The Bearing & Oil Seal generals are accurately, cylindrically Ground to give smooth running. Conveyors, Packaging, Crane travel, Material handling lift, Machine tools application. Looking for Cycloidal Reducers ?